Don't let knee injuries break your stride! The Thermoskin® Open Knee Wrap Stabilizer offers heat and compression therapy with a flexible design that moves with you. Three-layer Trioxin® Fabric wicks away moisture, while heating the skin and providing light compression. 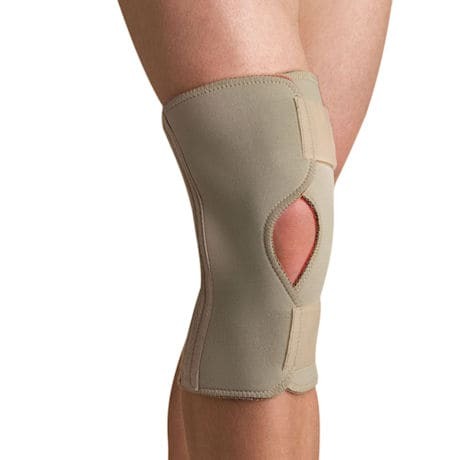 Cut-out over the knee cap protects bruised or sensitive patella, as side spirals deliver extra support. Our Knee Wrap adjusts for a custom fit, yet comes on and offeasily and goes on either leg! Green. Sizes: XS, SM, MD, LG, XL, XXL. Imported.